Thank you for your continued Canon Professional Services membership, Canon loyalty and for trusting Canon products for use in your business. The staff of CPS strives to provide imaging professionals like you with comprehensive service and support benefits. And we are always looking for opportunities to make the CPS program even better. After careful study and consideration, and with your valuable feedback, we are planning to roll out a number of enhancements and updates to the CPS program. The purpose of this email is to give you a summary of these enhancements and updates, which we anticipate will be effective for all members in two phases: the 4th quarter of 2013 and early 2014 with the introduction of a new CPS Cinema level. Details will be available on the CPS website as these enhancements and updates become available. We are renaming the Clean & Check process to Canon Maintenance Service (CMS) and eliminating the paper voucher. The number of items that may be sent in for CMS is being increased for eligible CPS members. Platinum members will be able to send 10 eligible items, and Gold members will be able to send 5 eligible items, during each membership year. The number of items sent in for CMS will be tracked by Canon internally. Based on your feedback, we are shortening the period for each evaluation loan from two weeks to one week. This will also have the effect of increasing the total amount of equipment available for evaluation loans to eligible members. In an effort to concentrate our efforts on our core professional members, we will no longer include the EOS 60D camera, and future successor model cameras, as qualifying equipment for any level. However, owners of such equipment will still be eligible to receive repair benefits covered by the program. In early 2014, the Cinema EOS C100 camera and all Cinema Prime Lenses will be added as qualifying equipment to the CPS Gold and Platinum membership levels. And we are planning to launch a new CPS Cinema level tailored to owners of other Cinema EOS cameras and lenses. In an effort to balance program benefits, we are adjusting the repair discounts from their current levels. Therefore, repair discounts are being changed to 30% for Platinum level members and 20% for Gold level members. Also, there will be a cap on the number of annual repairs to which the discount can be applied, Gold level members can receive the repair discount on a maximum of 10 eligible items and Platinum level members can receive the repair discount on a maximum of 15 eligible items. The annual fee for Platinum membership will be reduced from $500 to $300. The annual fee for the Gold membership level will remain at $100, and the Silver membership level will remain free to qualified professionals. For organizations with large amounts of eligible Canon equipment and/or large photography staff, we are launching Enterprise CPS, which is designed to suit the needs of medium to large size organizations like newspapers, photo studios, rental houses, etc. In addition to some of the traditional CPS benefits, Enterprise CPS clients can receive benefits like on-site equipment maintenance, higher repair caps and streamlined billing. The details of this new program will be provided at a later date. We have also increased our support of the professional imaging market in less direct, but significant, ways. For example, you may have noticed that, during 2013, CPS increased the number of major sporting events, training workshops, and trade shows where on-site support is provided to eligible CPS members. These events are an important way for us to support and communicate with our members. We recently opened two new service facilities, one in Hollywood, CA and another in Ridgefield Park, NJ just outside of New York City. These two new facilities are available to CPS Gold and Platinum level members (as well as our broadcast/cinema professionals). An advance reservation is required for all service and support requests handled by the Hollywood and Ridgefield Park facilities. CPS Gold and Platinum members requesting support should call the CPS hotline at 1 (888) CPS-4540 to make a reservation. And we are currently planning to open a third service facility that will support the Chicago market later this year. All with the goal of bringing Canon's award-winning repair and maintenance services closer to our CPS members. 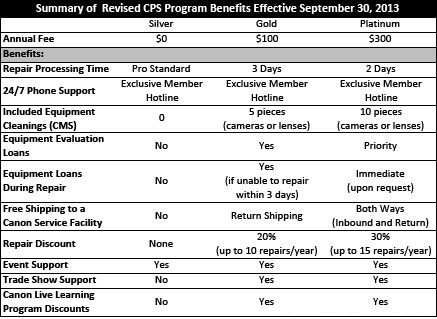 Although the CPS program is changing in some significant ways, some aspects of CPS member support are not going to change: our unwavering commitment to speed and quality, as well as acting on your repair and maintenance requests with repair turnaround times of two business days for Platinum members and three business days for Gold members, as more fully described in the program terms and conditions. Temporary loaners while products are in for repair will continue to be available per the terms and conditions of the various membership levels. And dedicated, priority support will still be available for CPS members via phone or email, 24 hours a day, 7 days a week. These enhancements will be rolled out via e-mail communications to our members, detailing the specific changes by membership level, effective date and describing new programs like Enterprise CPS and CPS Cinema. Ensuring your smooth transition to these new benefits is very important, so we want to hear from you if you have any questions. We are honored to have the opportunity to help you achieve success in your imaging pursuits and to support your passion for image-making. Thank you again for trusting Canon with supporting your business.